Suffering. A hard, difficult word. My classmates grimace at the thought of the images we are about to be shown – a young boy with a bloodied skull running through chaotic streets, a pregnant woman fainting from exhaustion in the aftermath of an earthquake, a crowd of children orphaned by Ebola. But though these images and situations are certainly jarring, the sentiment is disturbingly familiar. Portrayals of suffering in the media have become commonplace, even routine. Some question whether or not the public has become desensitized to even the most horrific of images. Sociologist Stanley Cohen argues that audiences are collectively suffering from “compassion fatigue,” as though human beings possess a proverbial quota of empathy that has long since been exceeded. But I don’t think we’ve exhausted the capacity to care. Rather, I think that we are so uncomfortable with the upsetting nature of portrayals of suffering that we feel compelled to disengage. 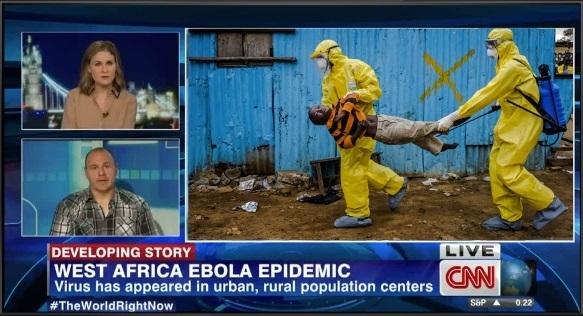 I’ll be the first to admit that, of course, the suffering of Ebola victims is hard to watch. But my vague discomfort is nothing compared to the experience that the Ebola victims themselves have undergone. The presence of Ebola may not be a pleasant reality to come to terms with. Which begs the question, ‘So what?’ I still have the great fortune of being able to confront difficult situations, thanks to the work of tenacious journalists, from the comfort of my own home. And by watching a meaningful portrayal of suffering, thereby coming to understand precisely what is at stake, I can learn whether and how I might influence the situation, even marginally. The first step lies in learning, as a consumer of news, to embrace discomfort. However, we must not misconstrue the role of the journalist when portraying instances of suffering. Though it may be the journalist’s responsibility to witness, it is not the journalist’s responsibility to rescue. As Charlie Beckett puts it in SuperMedia, “Journalism likes to think it is a superhero when it is really Clark Kent.” When we see a journalist covering a difficult scenario on the ground, it is easy to think, “The reporter should do something to help.” We may expect the journalist to break the proverbial fourth wall, to intervene as Anderson Cooper did when he “rescued” a young bloodied boy in Haiti. But when the fourth wall is broken, it is easily for the audience’s focus to become woefully misdirected. Attention is designed for the stories themselves, not the journalists covering them. Indeed, a journalist may do a disservice to those he wishes to help by inserting himself and his celebrity into the equation. But if Anderson Cooper had not intervened, how might audiences have reacted? Would he be blamed for behaving passively? This, I think, is the moment in which it is critical to remember that the job of the journalist is simply to report the news. It is the job of a doctor to provide medical care, the job of an NGO to provide disaster relief, the job of a government to provide a suitable polity for its constituents. A journalist is responsible for the news, and for the news alone. 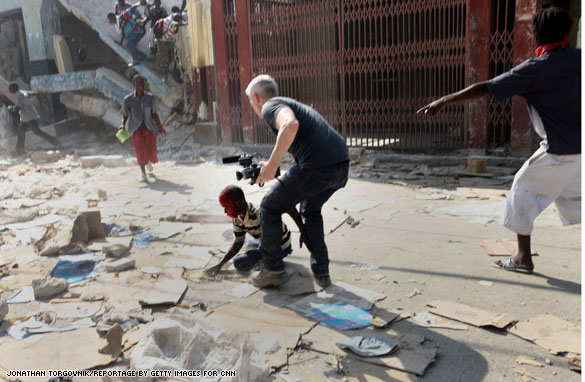 However, journalists are often the figures most visibly associated with instances of suffering. Sheer proximity causes us, as consumers of the news, to blur the line between journalist and hero. I don’t want to go so far as to suggest that journalists cannot behave heroically, or that Anderson Cooper shouldn’t have carried that particular child to safety. But when journalists are covering instances of suffering, it is important to remember that the journalists are not the ones at fault. They did not cause the suffering, and it is not their responsibility to fix it. We often confuse being upset by a certain situation with being upset by its coverage. What journalists can do is help illuminate where the responsibility does lie. In the case of many humanitarian crises, systemic failures come into play. Journalists can frame the root causes of these failures, and help to explain what caused particular manifestations of suffering in the first place. It would be intensely naïve to suppose that the work of journalists, enlightening the masses in this manner, can prevent future suffering entirely or indefinitely. But such enlightenment is still a productive place from which to begin, and I would argue that, tangentially, the careful coverage of suffering will retain a meaningful role in the news. We, as viewers, should consider it our responsibility to watch. Yes, we need coverage of “suffering”, but we also need a commitment to showing the “action plans” that support and provide ailment to recovery and achieving positive outcomes too. Critically, it is clear in the mind of the public that the powerful news media – even BBC news 24 – are extremely selective in what type of “suffering” is shown. Hence, it is seemingly much easier for a public body such as the BBC to go abroad an to highlight “suffering” rather than showing how government policy – who are their paymasters – have hindered and failed some groups in our community. By that, I mean actually getting to the heart of the problem!